The Lunatik Touch Pen from Scott Wilson and design studio MINIMAL is the third stylus from Kickstarter that I have backed since last year. This is the first one that provides both the combination of a pen and a stylus. It does it in a way that you only need one click of the retracting mechanism of the pen to switch between the two instead of having to remove a cap or insert an attachment. 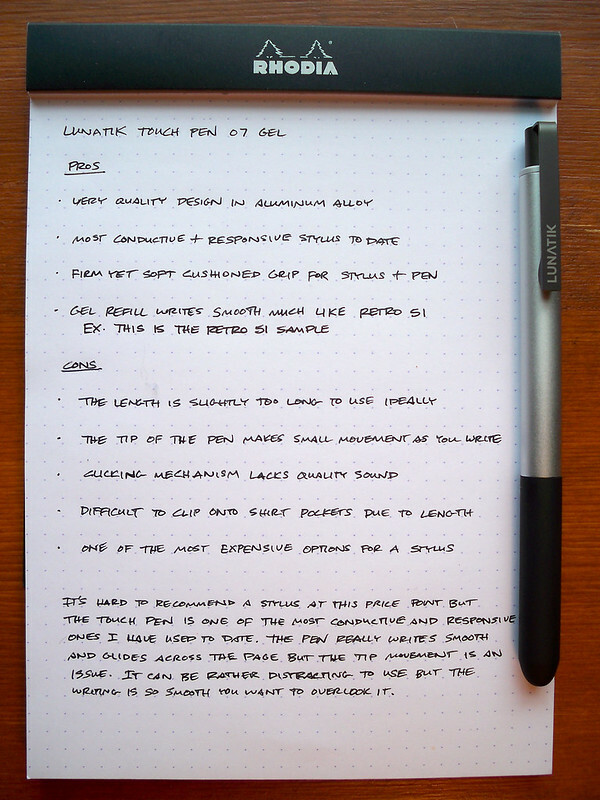 So, how does the Lunatik touch pen perform compared to the several other styli that I have tried? The Lunatik touch pen is probably one of the most conductive and responsive stylus writing instruments that I have used but has a few key drawbacks that keeps it from being perfect. I’m on a constant search to find that perfect stylus that is just as responsive as my finger but doesn’t leave the horrible finger prints on the screen of my iPad. Despite the advantages in working in pure digital format, the pen addict in me will never let that happen. The feel of pen against paper can never be replicated in a digital format on a glass screen. The Lunatik touch pen is an ideal solution to my problem and allows me to function smoother in both the digital and analog world. The pen portion of the stylus contains a high quality gel pen refill which functions similar to the same smooth quality found in the Retro 51 Tornado. These Japanese cartridges are 0.7 conical tip refills that are replaceable. The rollerball glides across the page moving smooth and fluid with a dark black ink. The refill is stated as being a 0.7 point but it writes much like an 0.5 in appearance. I’ve tried to see if several different refills would work with this pen and the one that worked rather well was the Pilot G2 .38 point gel pen. 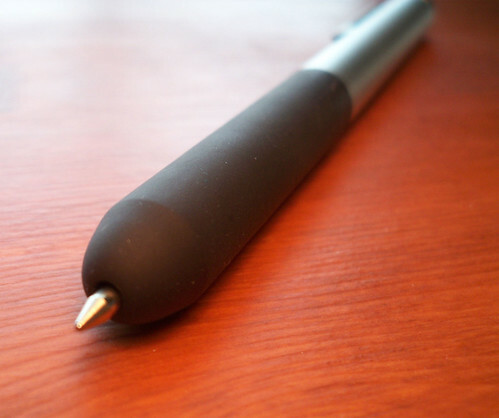 The G2 refill can be inserted directly into touch pen without any hacks required to use. The Kickstarter project page also confirms that the Cross Rolling ball refills will also work with the Touch Pen but I have yet to try those. The high grade silicone rubber material not only serves as the stylus but the main grip on the pen as well. There were two main versions of the touch pen on Kickstarter; a high grade plastic polymer version or the matte aluminum alloy version. I choose the lightweight aluminum alloy version because of the quality look and I thought the added weight would enhance the Touch pen. The pen also includes a die cast clip coated in PVD plating which is quite strong and is able to clip to anything securely. I would have to say this is the best responsive stylus that I have used on my iPad to date. This isn’t the same small generic soft rubber tip that you find in most styli that caves in with a single touch. 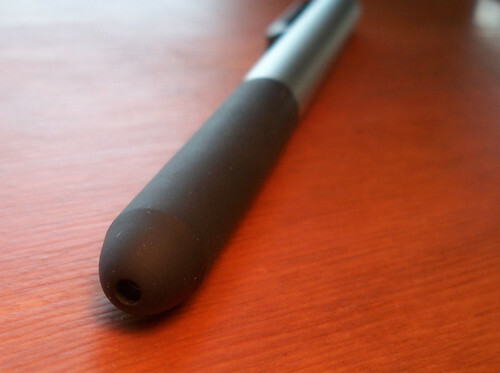 The soft stylus material covers about 2.5 inches from the tip down the main body. The stylus is completely firm but soft at the grip and the tip of the pen is slightly flexible. This results in barely having to use any pressure against your touchscreen to register any type of marks whether or browsing the web or using a painting app. It doesn’t even matter how you hold the touch pen, it will still work at any angle. It’s the perfect stylus to browse the web on your tablet or mobile device. You may have some concerns about the pen scratching your screen when you are using the stylus but I wouldn’t worry. The refill is retracted far enough in the body of the pen that it wouldn’t even come close to touching your screen. The main problem I have with the touch pen is almost a deal breaker for me. The length of the Touch pen is fine for using it as a stylus but it is slightly too long to use as a pen comfortably. Much of the weight of the pen is toward the back end which forces you to compromise holding the pen up higher to maintain some balance. The pen could have used almost a half inch cut from the length to function ideally. People with smaller hands would be at a disadvantage here as the pen would be rather difficult to use for a significant amount of time. My hands are on the larger side, so it isn’t as much of an issue as it could be. Even with my larger hands, the length of the Touch pen can still be a little awkward to use. The length of the body also causes problems in using the clip effectively. Clipping the Touch pen to a shirt pocket is quite impossible due to the length which hangs out above the shirt pocket. The clip also extends out away from the body of the pen and is long enough where it could effect the way a person writes and uses the stylus depending upon how they hold it. Another major problem that I have is there is a small amount of movement at the tip of pen when you use it to write with. This small amount of movement makes the pen a difficult to use at times due to the small rattling you hear as you write with it. The Touch pen also seems to want loosen and unscrew itself as you use it that I have to keep tightening it on occasion. The G2 refill provides a slightly better experience because it has a bigger tip than the default refill but there is still a little movement at the tip of the pen. The retracting mechanism on the Lunatik Touch Pen has a problem. There is no satisfying click sound when you extend and retract the refill. The Touch pen just sounds like the spring inside is getting stuck when you are sliding the plunger down. Much of the pen portrays quality but the click mechanism makes it feel cheaper when you use it. So, is it worth looking into? It depends on what you plan to use the Touch pen for. I would say definitely for the stylus and somewhat for the pen. At 40 dollars, the alloy Touch pen is one of the most expensive styli compared to the other choices on the market. Unless you plan on using this stylus on a regular basis then I can’t recommend it for the price. If you want one of the best responsive styli to date that just screams quality every time you use it then look no further than here. Unfortunately, the pen is not going to be my first choice to use due to the tip movement and the overall length. The pen writes smooth but the tip movement is just distracting to use at certain times. This is disappointing because the stylus grip is quite comfortable to hold to write with. Overall, the Lunatik Touch pen is a highly responsive quality stylus/pen hybrid that is worth the price if you are looking for an ideal stylus to use on a regular basis. Check out Lunatik.com if you are interested in pre-ordering your very own stylus pen in Plastic or Alloy version. Estimated shipping will start sometime this month once all of the Kickstarter pledges have been fulfilled. Posted on August 8, 2012 by Brad Dowdy and filed under Lunatik, Pen Reviews, Stylus.